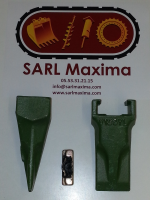 Replaceable Tips : SARL Maxima, Specialists in the sale and reparation of machines and accessories for the construction industry. Importer and distributor of both hydraulic and pneumatic equipment. SARL Maxima offer an array of Ground Engaging Tools (G.E.T) for specific industries and applications. Protect more expensive components of a machine or bucket. SARL Maxima is committed to providing the best G.E.T. value possible to our customers. Why bother with different types of tip? The two part system can give greater flexibility for customers who want to change between tip types. It can also ensure tooth breakage/wearcosts are kept to a minimum, and to ensure you’re not wasting fuel by struggling to dig with blunt or incorrect teeth. Which is the best tip? There is no ‘best’ tip, and tip choice is not an exact science, particularly in varying ground conditions. However, if you use the best compromise for your particular job, and review the criteria regularly, you can save a great deal of time and effort. Remember that tips may be swapped before they are worn out, and kept aside for future use. When you are buying a two part system, ensure that you chose one that can be easily sourced in the future.